The construction of the Keener Wiener Rotisserie stick allows for continuous and effortless rotation. There are three different methods to achieve this rotation; each depending on hand grip position. Check out the video clips or look at the diagrams below. When using stick fully extended, like so... hold it by front handle and use thumb and forefinger of free hand to wobble the end of the rear handle in a circle. When gripping up on the shaft... hold one handle fully in each hand, and use wrist action to wobble the front of the rear handle in a circular motion. For one handed operation... rest the shaft on edge of firepit, hold handles as shown, and use wrist action to wobble in a circle. The stick will rotate! Unloading... pull the rear handle down by hip... wire turns out of the way... wiener comes to you and automatically assumes best position to be grabbed with the hot dog bun. This is the "waiting for the hot dog bun position". Most of the time, loading is relatively straight forward.. simply slide the item you want to roast onto the point. 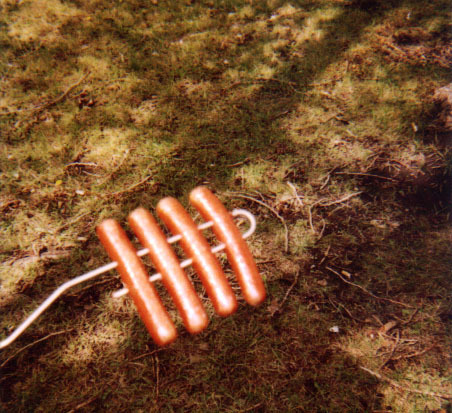 However, creating a rack of weenies by loading more than one wiener onto the stick involves a different technique. Watch the video clip below to find out exactly how.